Combine the first ten ingredients in a bowl and stir to combine. Spread marinade evenly over both sides of the chicken breasts and place them in your baking dish. Place in the fridge for an hour to marinate. 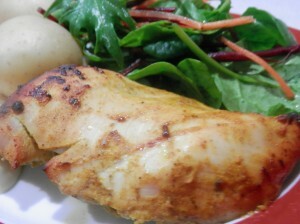 Bake your marinated chicken breasts for approx 35 minutes, or until cooked through. Remove from the oven and allow to cool slightly before slicing. Combine the mayonnaise and lemon juice and serve as a dipping sauce, or if you are making a burger, spread over the bread, and top with slices of chicken and salad.